4M is known for its popular innovative toys that promote curiosity, creativity, exploration, fun and excitement. From the age of 5, your child likes to move around, solve puzzles as well as portray their creativity through open-ended creativity toys. Make-believe games are the best at this age as they provide unlimited possibilities. The child can be anything they want to be, how they want to be, when they want to be as they explore fantasy worlds and adulthood. The 4M Crystal Mining Kit encourages the inquisitiveness of the child as they dig for the crystals, gives a sense of accomplishment when they display them and allows the parent and their peers to give them what they crave for the most; praise and approval. If your kid loves to get down and dirty (I am yet to meet a kid who doesn’t), this is the perfect toy for them. 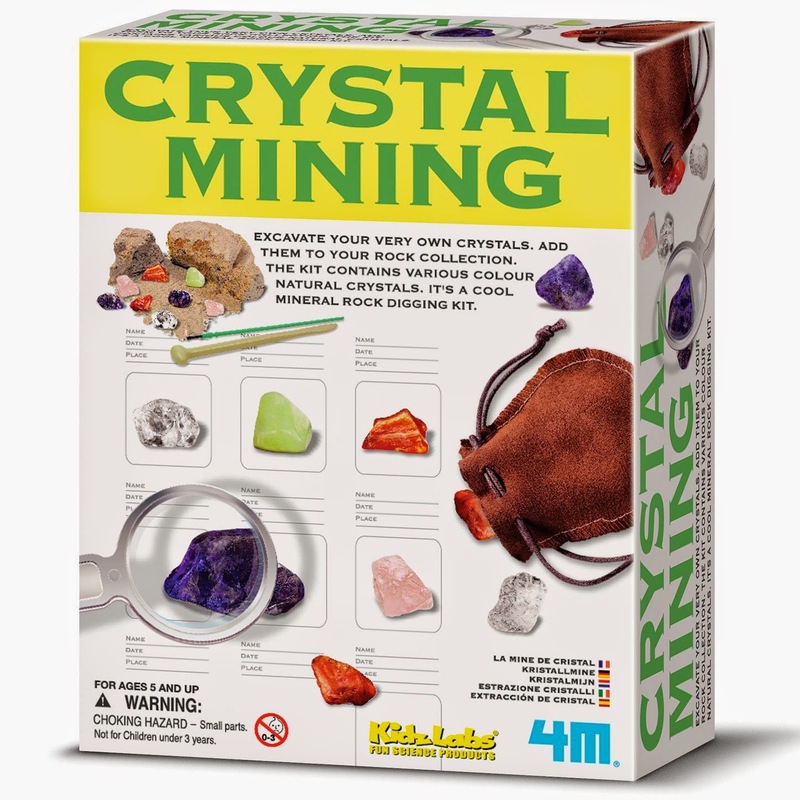 4M Crystal Mining Kit is so fun and hands on that your little one will stay occupied for hours. The toy comes with a hard plaster block in which 8 crystals are embedded just like in the mining field. To excavate the crystal gems, the child has to use the digging tools provided to chip away. Present an eager curious mind with a challenge and you already know what to expect. The little one will be hooked. The thrill and fun of harvesting the crystal gems and displaying them on the board is simply irresistible. Once all the 8 crystals have been excavated, the kid can then examine each at a time using the magnifying glass. The kid also gets to learn interesting facts and qualities of the mined crystals. This gives additional learning for the five year old before they can display them on the display board. • Some reviewers have reported that the block was too hard for the hammer that comes with the kit. Pouring water on the block makes it soft enough and eases the mining process. The plaster block can be hard to excavate when dry. This is especially the case when your child is a little younger. To ease the mining process, consider pouring water on the block. It softens the plaster of the 4M crystal Mining Kit block and makes it easier for the kid to chip away. It might take a while to get to the first gem. If this happens, turn the block and start chipping on the other side. But just like in mining, you might give up just as you are about to get there. The good thing with the block is, you know you will eventually get there. Once he gets started, your kid might have a hard time stopping. If you would like him to play with the mining kit for longer than one day, suggest that they excavate a number of crystals in a day and not all at once. A pouch to store leftover crystals. Check out the 4M Crystal Mining Kit on Amazon.com now to see more details and read other customer’s reviews now.